MILWAUKEE (AP) Giannis Antetokounmpo took eight days off and missed back-to-back games to manage chronic pain in his right knee. ”I definitely felt lost because this is what I love to do, to play games,” Antetokounmpo said. 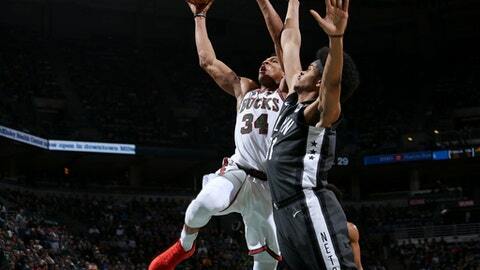 The All-Star forward returned to the lineup Friday night, scoring 41 points and adding 13 rebounds to help the Milwaukee Bucks beat the Brooklyn Nets 116-91. He sealed it late, dribbling between his legs before hitting a jumper over Quincy Acy and drawing a foul. Antetokounmpo made the free throw, and hit a 3-pointer on the next possession. Khris Middleton added 21 points for the Bucks in their second game since coach Jason Kidd was fired Monday. They also beat the Nets for the ninth consecutive time. DeMarre Carroll and D’Angelo Russell had 14 points apiece for Brooklyn. Milwaukee built a 28-point first-half lead. Brooklyn, which had just 35 points at the half, scored 37 in the third quarter and got within seven points late in the period. The Nets, coming off a one-point loss to Oklahoma City on Tuesday night, struggled offensively throughout the first half, connecting on just 26 percent of their shots, including 4 of 20 from 3-point range. Milwaukee led 58-35 at the half. The Bucks opened on a 16-2 run and led 33-15 after the quarter, led by Antetokounmpo with 11 points. Police officers used a stun gun on Bucks rookie guard Sterling Brown and arrested the 22-year-old Friday after a confrontation at a pharmacy parking lot. ”It’s a personal issue I’m dealing with right now,” Brown said before the game. Brown had what appeared to be a bruise and scratches on the right side of his face. Officers contacted a man believed to be Brown after seeing a vehicle parked across two handicapped parking spots while doing a business check at about 2 a.m. Asked if there could be any discipline for Brown, coach Joe Prunty said: ”We believe it will be resolved quickly.” Brown entered the game midway through the first quarter. He scored four points in 27 minutes. After missing 31 games with a knee injury before returning to action last week, D’Angelo Russell showed signs of his old form. ”He got in a good stretch there,” Atkinson said. ”He looked like he did in the beginning of the year for us.” Russell made consecutive 3-pointers from about 28 feet late in the third quarter. ”Seeing the ball go through the net is definitely a good feeling,” Russell said. Nets: Brooklyn shot just 22 percent in the first quarter, including 2 of 13 from 3-point range. … Rondae Hollis-Jefferson limped off the court midway the second quarter with a strained right groin and didn’t return. ”That was a big blow to our defense,” Atkinson said. … Brooklyn made buzzer-beating 3-pointers at the end of the first and second quarters. Bucks: G Malcolm Brogdon missed the game due to right calf soreness. … Former Milwaukee player Vin Baker has been hired as an assistant coach. Baker most recently served as a pre- and postgame analyst for Bucks telecasts and served as a volunteer coaching assistant. … Milwaukee Brewers players Josh Hader, Brett Phillips and Jacob Barnes sat courtside. Nets: At Minnesota on Saturday night. Bucks: At Chicago on Sunday.